George Knott joined the Collingwood Harriers on 02/12/1929 and thus was started an athletics career that lasted some 70 years. He competed in many events as most did then, but specially middle distance & pole vault. 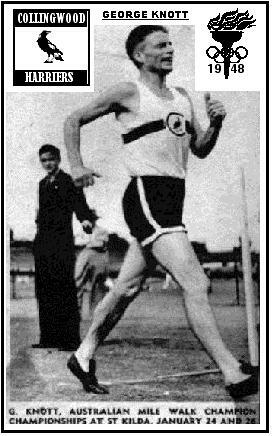 In 1930 he had his first race walk in a club championship, and from then on mixed running and walking. 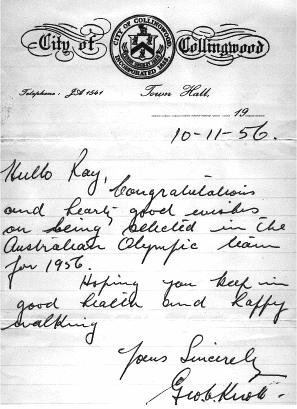 Coached by lifetime friend Bill Tunaley, George improved his times and from 1936 onwards, he won many Victorian walk championships, as well as the Australian Championships over 1 mile and 10,000 metres. During the war, championships were suspended, but after things settled down, he was in top form setting a world best time for 10,000 metres walk and gaining selection for the 1948 Olympics in London. In that event he finished 7th in his heat in the 10,000m walk. He continued to race A grade at Interclub for many years, and would step in when the team was short of a walker, and he continued in the lower grades until the 1970s. In veteran competition George and Bill Tunaley would line up for field games, jumps, steeplechases and walks, as they had done in their youth, and George raced with the VRWC up till his late eighties. There wasn't a trick that George didn't know, and he taught the other Collingwood walkers how to use them to the club’s advantage. To confuse the opposition, he would take the front row and just before the gun he would give his mate an almighty shove in the back so that he would find himself way out in front with George hot on his heels. During his stint as Mayor of Collingwood, George took two promising junior Collingwood walkers to Adelaide for the South. Aust. Championships. They travelled in the Mayoral car, but the stopover along the way that night was spent just off the road with the boys sleeping in the car and George under the stars. George was a member of VRWC from the 1930s onwards and was one of the stalwarts over many years. His life membership was awarded in 1964 but he remained an active member of the club for many years after that. But his activities were not restricted to VRWC. He was also awarded life memberships of Athletics Victoria and Collingwood Harriers and was awarded an Australian Sports Medal in 2000. George died in early 2001 at the age of 90, leaving a legacy of 70 years of involvement in athletics as both a fierce competitor and as an official. The George Knott Trophy has been instituted by A.V. and is awarded annually to the winner of the male 5000m track walk at the Victorian Track and Field Titles.